Sci Fi Channel has green-lighted Sanctuary, the first television series to use live-action actors against virtual sets in the style of the features 300 and Sin City. Sci Fi has ordered a full 13-episode season of the new scripted drama series, which originated online as the first high-definition sci-fi Web series. Sanctuary hails from the Stargate SG-1 trio of star Amanda Tapping, writer-producer Damian Kindler, and producer-director Martin Wood, who are executive producing the series with Sam Egan. Tapping stars as the enigmatic Dr. Helen Magnus, who is on a quest with her young protege, Will Zimmerman (Robin Dunne), to track down, aid, and protect strange creatures that walk the earth. Kindler created Sanctuary, and Wood directed the Webisodes starring Tapping. Sanctuary launched on the Internet last year using a subscription model, but many of its Webisodes found their way to video-sharing sites like YouTube. Because of Sci Fi’s ties with Tapping, Kindler, and Wood through the Stargate franchise, the network’s brass had discussed Sanctuary with them even before it launched as a Web series. Talks shifted into high gear when the trio came back with a DVD containing two one-hour blocks of Webisodes. TV networks have been trying to use CGI-generated environments on TV series, most notably ABC’s efforts with Dinotopia. But “this is the first time the technology is mature enough and inexpensive enough to do it,” Stern said. 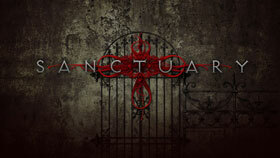 Sanctuary, which features 90 percent CGI sets, will be retooled for its transition to television, including the creation of a new two-hour premiere episode. Still, a lot of the footage from the Web series will be used, with some enhancement of the visual effects and the CGI background to play better on the TV screen.